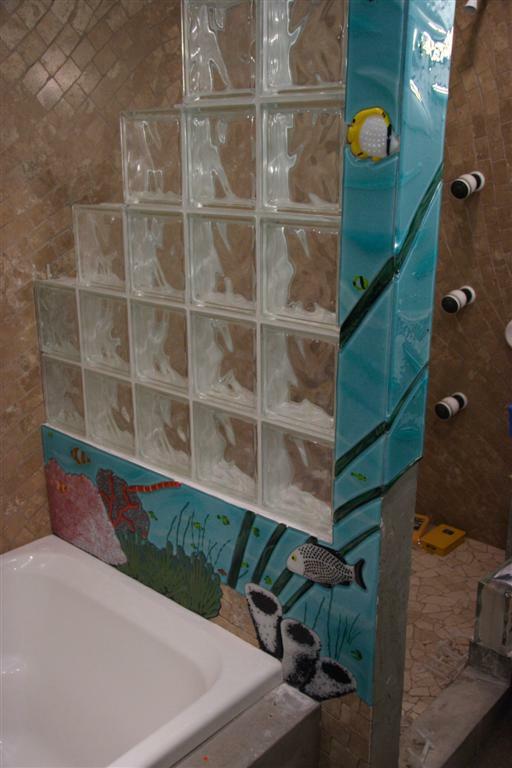 With all of this Florida, glass block, and underwater theme, glass tiles seemed like just the right accent for the remaining bathroom half-walls. 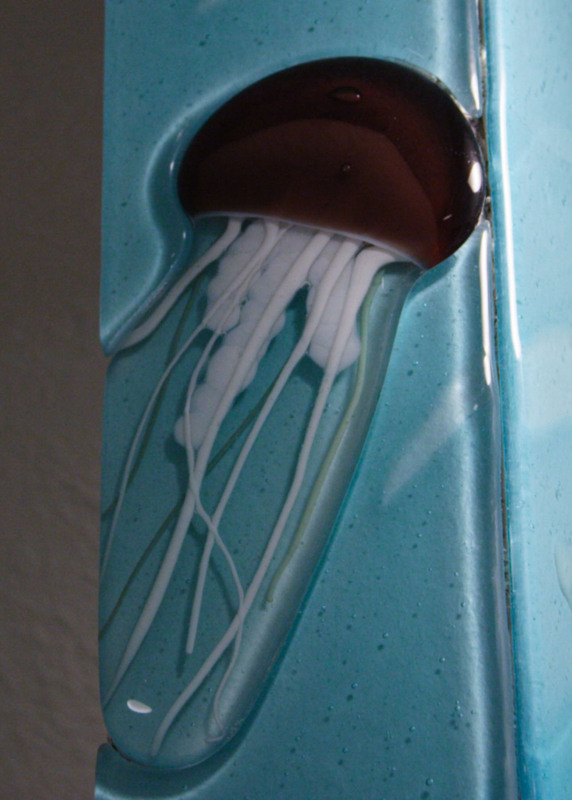 In the spirit of doing as much as possible myself, I decided to take a class, buy a kiln, and see what I could cook up in home-made glass tiles. This is a very exciting medium, since there are relatively few glass artists right now (unlike woodworkers), and to see something this obviously custom is pretty captivating. Here's something of an overview picture. You can see where I have stopped work and need to pick up again. All of these pictures are hyperlinks to larger versions. In Internet Explorer, the pictures will fill your browser up to a certain size. Expand the browser to be full size for maximum view-ability. This shows the glass mural a bit better. 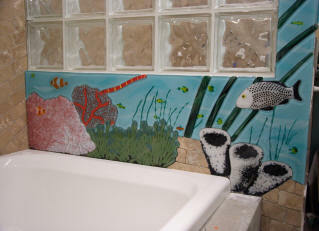 Note the use of the limestone tiles from the side wall into the mural. 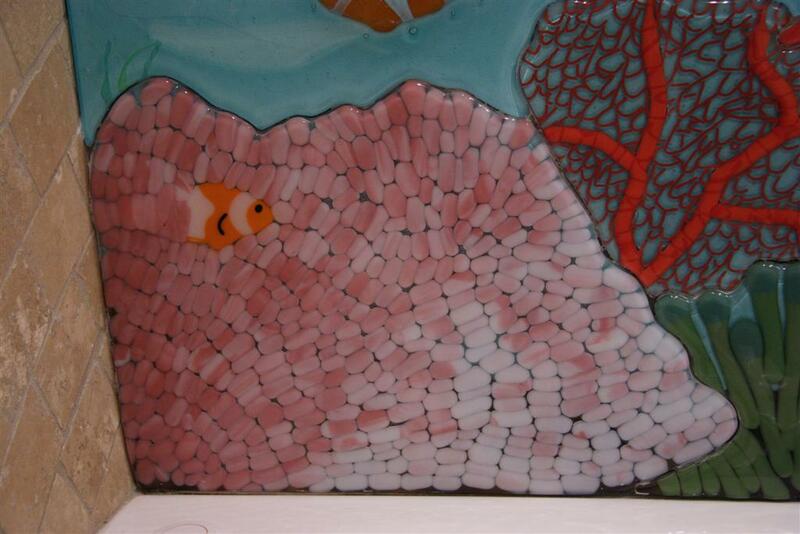 This "coral" is simply small pieces of pink glass fired round in the kiln, and then fused to a piece of clear glass of the appropriate shape. This is done through a similar technique, except that the red webbing is actually a thin rod (like angel hair pasta) of glass that is bent in a torch and cut to make small "U"'s. They are then painstakingly arranged on the clear glass and fired in. This fish is really much more spectacular in person than in pictures. When clicking through to get the bigger picture, don't forget how much better it will look with grout. 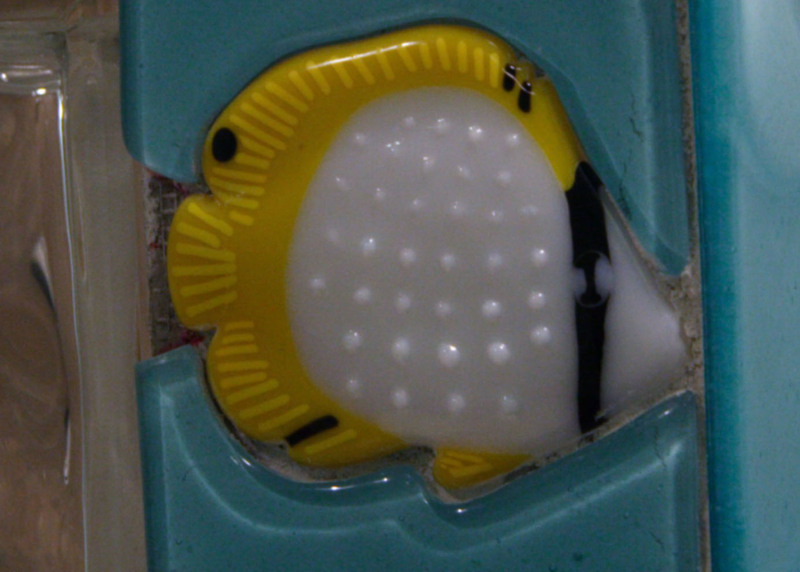 Here's a small spotfin that is patterned after the one shown below. This is my favorite tile and is too far up the post to show up in the whole scene photograph above. 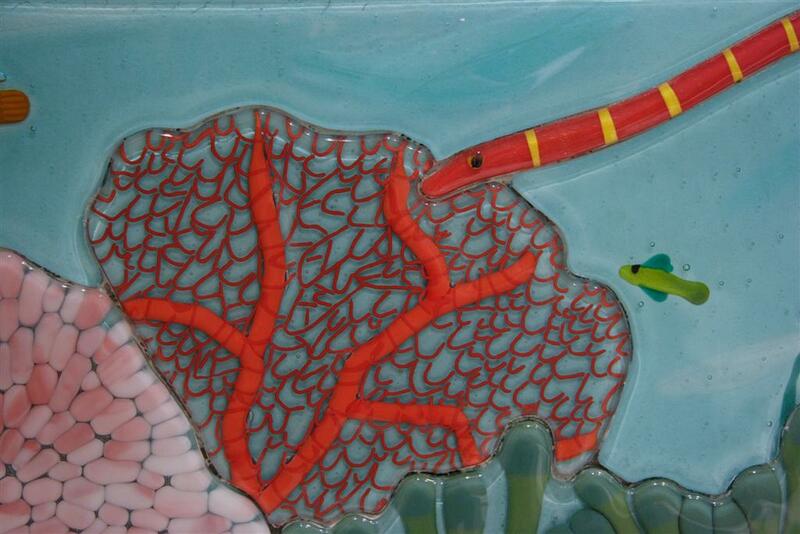 The tentacles are made from glass pulled smoothly in a torch and then fused together. The latest addition is called a "Coney" and it's in its interesting-looking bicolor phase. It changes its look several times in its lifespan. 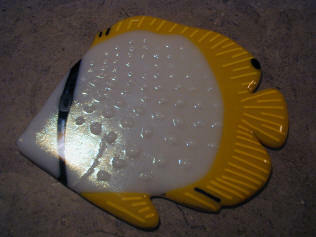 This fish is different than the previous one because its eye is made from glass that was manipulated directly in a torch flame. The dorsal fin spines are similarly made from different color strips and rods of glass fused together and twisted in a flame. 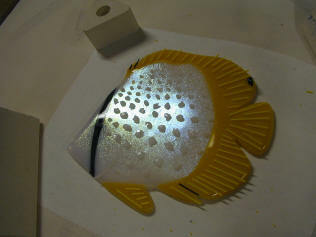 Although it doesn't photograph well, the body is defined by iridescent clear glass that gives real depth to the fish. 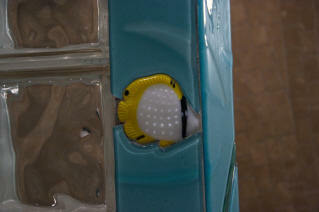 Here's one of the new glass fish. I think it's called a Spotfin. Below is the making of this fish in detail. 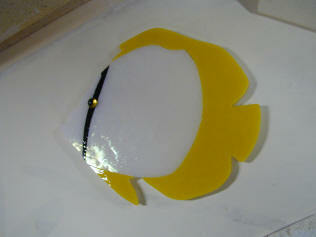 To make this Spotfin, I started out with a piece of clear base, which broke the wrong way during cutting. Since it will be underneath other layers, I really didn't care about the break. A printing of the picture that I am copying is underneath. 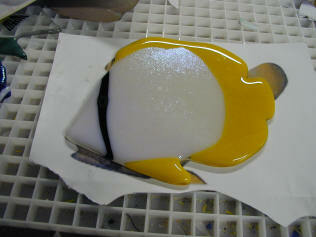 The five parts are cut and placed together carefully on top of the clear and in the kiln. 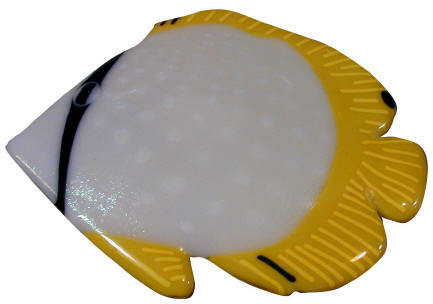 I had previously made some fisheyes by placing a small chip of black on top of a larger chip of yellow. When firing these chips, they not only fuse together, but become quite spherical because of the surface tension. Here's the result of that first firing. All of the edges are rounded ("fire-polished"). Notice how the eye has become complete fused into the black stripe. This is a mistake that we'll fix later. Also, we'll have to clean up the edges around the tail, which has fused together too much. A special diamond coated jigsaw makes quick work of that. Next, we add a few interesting details. Tiny rods of glass called, "stringers" are fashioned into spines in the fins. 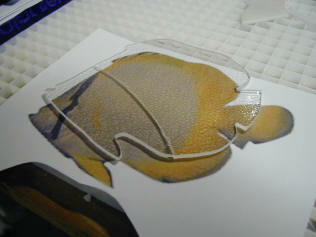 crushed chunks of glass called "frit" is arranged onto the body to give some texture. Rather than the full fuse temperature that was used in the last firing, we'll "tack-fuse" these elements into place so that they still give some surface texture.